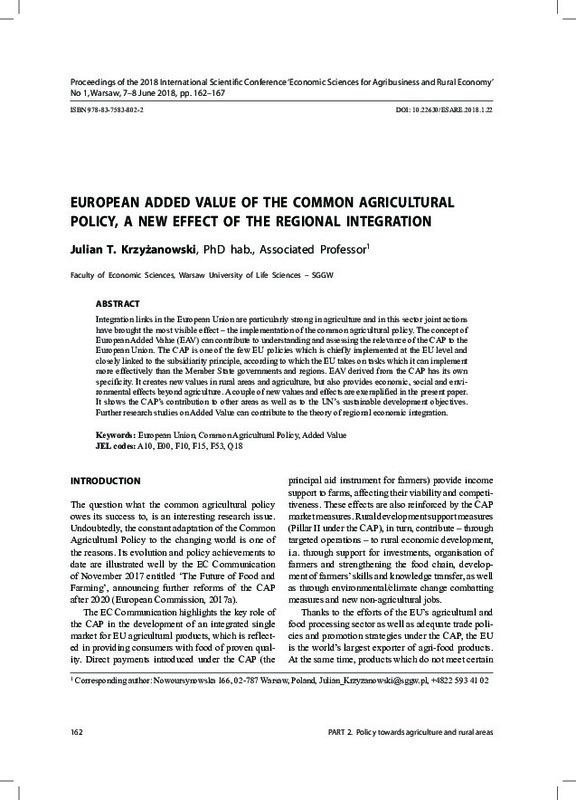 Integration links in the European Union are particularly strong in agriculture and in this sector joint actions have brought the most visible effect – the implementation of the common agricultural policy. The concept of European Added Value (EAV) can contribute to understanding and assessing the relevance of the CAP to the European Union. The CAP is one of the few EU policies which is chiefly implemented at the EU level and closely linked to the subsidiarity principle, according to which the EU takes on tasks which it can implement more effectively than the Member State governments and regions. EAV derived from the CAP has its own specificity. It creates new values in rural areas and agriculture, but also provides economic, social and environmental effects beyond agriculture. A couple of new values and effects are exemplified in the present paper. It shows the CAP’s contribution to other areas as well as to the UN’s sustainable development objectives. Further research studies on Added Value can contribute to the theory of regional economic integration.